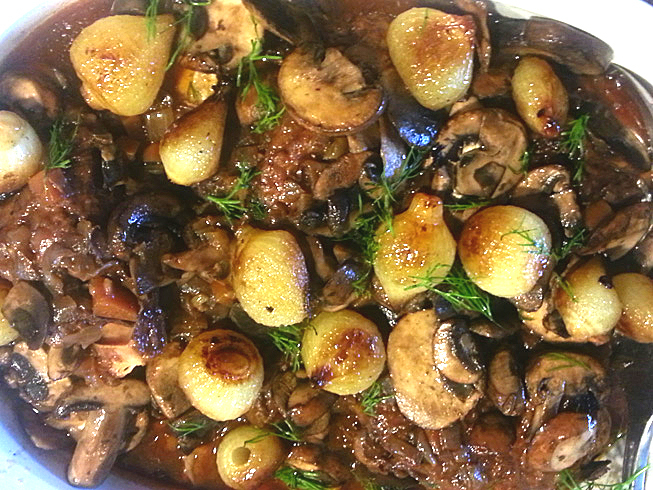 Slow cooker Coq au vin. 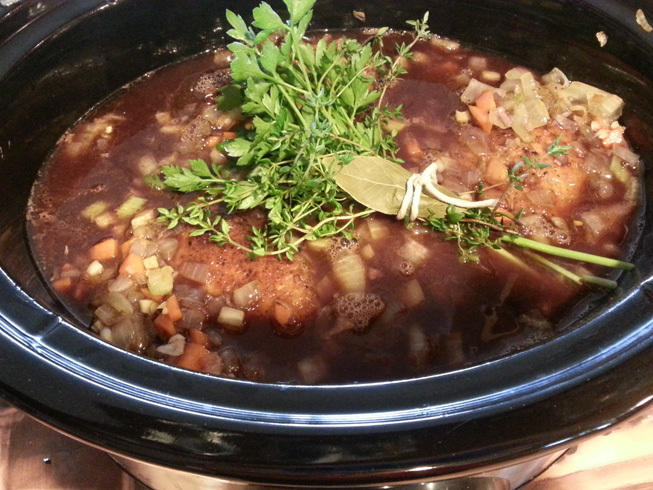 I make great use of my slow cooker, so that by the time we all get home from work and school there is a tasty meal ready, and I have time to check homework, drive kids to and from activities and play games. This recipe, from a book by Laura Frankel “Jewish Slow Cooker”, is a wonderfully tasty version of the classic coq au vin. You can prepare the vegies, and brown the chicken in advance, and it makes life a lot easier and dinner a lot more scrumptious. Preheat a slowcooker to low. Place a large saute pan over medium -high heat. Lightly coat the bottom of the pan with olive oil. Cook the mushrooms until they are browned and fragrant, about 5 minutes. Reserve the mushrooms in a covered container until they are needed. Pat the chicken pieces dry with paper towels. Lightly season the chicken with salt and pepper. Mix together the flour and porcini dust. Dredge the chicken in flour mixture. Brown on medium heat for 5-7 minutes per side in batches. Transfer each batch to the insert. When all of the chicken has been browned, drain off all but 2 tablespoons of fat. Cook the onion, shallots, carrots and celery in the saute pan in batches, until the vegetables are lightly colored, about 5 minutes per batch. Season each batch with salt and pepper. Add the garlic to the last batch and cook for 3 minutes more until the garlic is very fragrant and has softened slightly. Transfer each batch to the insert. Increase the heat under the saute pan to medium high and add the wine. Scrape up any browned bits with a wooden spoon. Add tomato paste and stock and mix. Add the wine and bouquet garni to the saute pan. Cover and cook on low heat for 8 hours. Gently remove the chicken pieces (they might fall apart) to a serving platter and set aside to keep warm, tented with foil. Pour the braising liquid through a fine-mesh strainer into a large saucepan. Press on the vegetables to get all the liquid, then discard the vegetables. Skim off and discard the fat. Bring the liquid to a boil, then simmer until about 2 cups remain. Add the pearl onions and mushrooms to the sauce to warm then. Spoon the sauce over the chicken. How to peel and Saute Pearl onions. Bring a pot of water to a boil. Blanch the onions for one minute and then add them into an ice bath. Dry them with a paper towel, cut off the root end, and the peel with easily slide off. To give onions a gorgeous brown color and caramelized flavor, saute them in olive oil or butter over medium heat until they are golden. Don’t skip the porcini mushrooms and the pearl onions, they add great flavor to a wonderfully scrumptious meal. 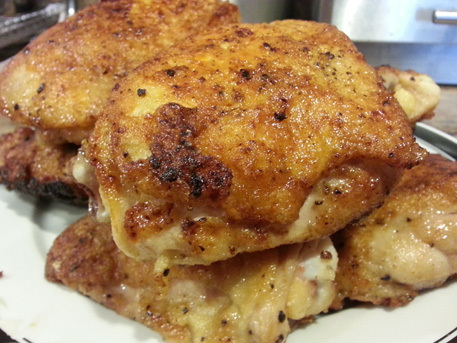 *This recipe can be easily made using a dutch oven in the stove. Set stove to 325F and cook for 4 hours.